Chris Goddard is one of the Bay Area’s finest Blues and Fingerstyle guitar players. His Blues sound is often compared to that of Brownie McGee, while his fingerstyle playing is akin to the likes of Doc Watson and Chet Atkins. 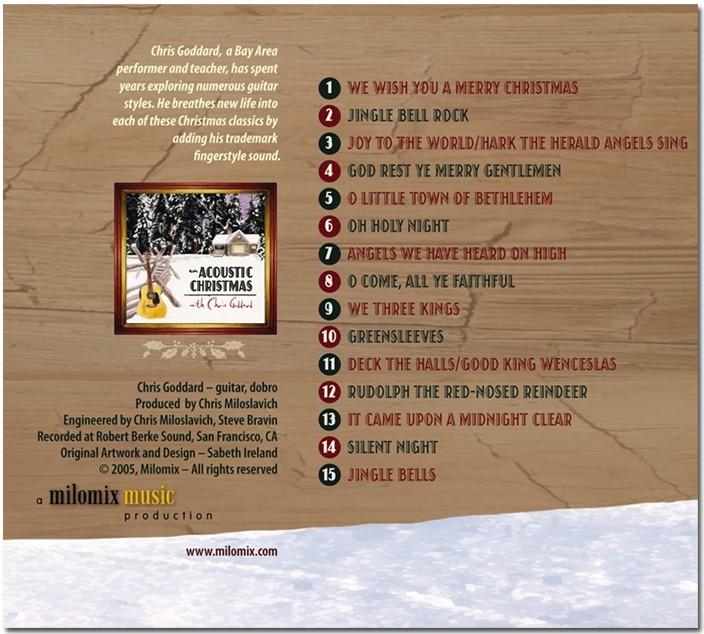 Chris has been exploring various guitar styles for more than thirty years, and has developed a trademark sound that he tastefully displays on this classic Christmas collection. A bay area performer and teacher, Chris has spent years exploring numerous guitar styles. He breathes new life into each of these Christmas classics by adding his trademark fingerstyle sound. This year, 100% of downloads sold will go directly to Chris Goddard. Please help support a great local artist! Purchase using PayPal or with a credit card by clicking the “Buy Now” link below. You will be sent to a download page upon completion of your transaction. File format will be all the songs in one .zip file. Smart phones may require third party apps to view files. Thank you!